This individual Report Declining Credit Card Growth: A Glass Half Full is available for purchase. This Report is available to members of Mercator Advisory Group’s Credit Advisory Service. Please be advised that this Report is normally part of a research and advisory service that provides ongoing support throughout the year. As such, this Report contains significant depth of content that is selected for its strategic importance to our members. (For a description of these services, see our Advisory Services section). This report explores the topic of declining growth rates in credit card outstandings and payment volume. Conventional wisdom suggests the golden age of credit card growth is over in the United States, while at the same time, debit card volumes are growing at rates not seen on credit cards for a decade and are poised to overtake credit. 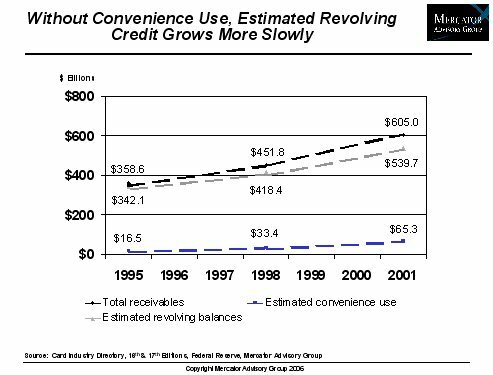 As this report will illustrate, there are plenty of reasons why the credit card industry is rapidly changing. Credit card issuers need to be cognizant of these multiple influences as they set their strategies, as they are fighting a marketing battle on multiple fronts. Simply stating that growth is slowing or that the market is maturing grossly over-simplifies the credit card issuing environment. Indeed, given the confluence of significant competitive and economic events, it is perhaps remarkable that the news for issuers is not worse. Indeed, a wide array of opportunities exist for credit card issuers wishing to take on the market's challenges. While declining credit card growth is a fact, it is impossible to pin the trend on a single cause. The report identifies eleven market-related conditions that contribute to slowing credit card growth, including product, consumer behavior, and macroeconomic influences. Some changes can be viewed as primarily evolutionary in nature (e.g. debit substitution) and moving primarily in one direction, while others may be cyclical and tied to the broader economic environment (e.g. changing rate environment). In addition to reviewing market factors driving today's credit card marketplace, the report reviews a number of strategic tools that may be used by credit card issuers to revitalize their growth in originating new accounts and building volume with existing accounts. Ken Paterson, Director of the Credit Advisory Service at Mercator Advisory Group and the author of this report indicates that; "As a long-time leading payment product, the credit card industry has perhaps had the luxury of not needing to worry about changing consumer behavior or the fact that as a mature product, new products might siphon off significant volume. Economic cycles, not always pleasant to handle, have nonetheless been weathered in the past. Today, there is simply more to worry about." The report is 35 pages long and contains 20 exhibits.